1. Empty the contents of the parfait into a bowl and mix using a whisk. Place the whisked parfait into a piping bag and fill 12 half sphere silicone moulds measuring 3cm in diameter*. Using an offset spatula, ensure the top is flat. Put in the freezer for at least 4 hours, or until frozen solid. 2. Remove the spheres from the moulds and, using a blow torch, lightly melt the flat side. Join 2 halves of the spheres to form 1 full round. Insert a toothpick in the top and fill in any gaps in the balls with leftover parfait. Place in the freezer. 3. For the tomato jelly, place the tomatoes in a blender and blitz until puréed. Pass the purée through a fine sieve. Weigh 125g of the sieved tomato juice into a bowl, add the ketchup, salt, sugar and enough red food colouring to give a bright tomato-red colour and place in a small pan over low medium heat. 4. Soak the gelatine leaves in cold water. When soft, squeeze out the excess water and add to the pan with the purée. Allow the gelatine to melt, stirring occasionally. 5. 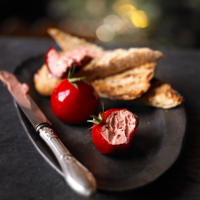 To assemble the tomatoes, allow the tomato jelly to cool to 19°C and, holding the toothpick, dip the chicken liver parfait balls into it twice. Place the toothpicks on a piece of Styrofoam or card and keep in the fridge for a couple of minutes. Remove the toothpicks and place on a tray lined with parchment paper. Keep refrigerated until needed. 6. Before serving, place the reserved stalks on top to cover the toothpick holes. This recipe was first published in Tue Nov 18 13:13:00 GMT 2014.